We reviewed the most popular 15 air fryers on the market, across a range of uses and settings. For it's oustanding performance at an unusually low price, "cook anything" capacity, and sleek design, the Gowise 5.8qt Electric Air Fryer was our number 1 pick. Last Updated: 11 April 2019 - This post contains affiliate links. So you’ve heard people raving about them, and now you’re ready to jump on the Air Fryer bandwagon. Let me say first: It’s a wise move. Air fryers take something that we all love (fried foods) and reduce the health risk without destroying the taste. These things are not a fad. They’re not going away. With these amazing cooking appliances, you’re able to enjoy your favorite fried foods with up to 75% less fat content. If you’re trying to avoid spending hours researching Air Fryers, trying to understand which one you need, what’s the right size, how much power do you need, or which one’s the best value for money, you’re in the right place. 1 How Do We Rate Air Fryers? How Do We Rate Air Fryers? So, when it comes to determining which are the best air fryers on the market in 2018, how do we go about it? In measuring fryers, we use a set of five criteria. We look at the overall features offered by the manufacturer relative to how expensive the machine is. We survey and review customer ratings on a variety of platforms to determine the greatest customer experience. We consider to what degree consumers report problems with their machines relative to the severity of those problems. We consider how durable the machines are and to what degree the manufacturer’s warranties provide for the longevity of the machine. We consider any value-added bonuses offered by the manufacturer relative to other bonuses from other producers. Given these criteria, what are the top 5 air fryers in 2018? Let’s take a look. Newly crowned at HBS, the GoWISE 8 in 1, is up two spots to number #1 for 2018. Short answer why? It does the frying work of much more expensive machines, covering an enormous range of uses for a fraction of the cost. To be specific, it’s the lowest priced air fryer in our top 5. Cheapest doesn’t often mean best, but in this rare case, astute buyers can take advantage of a full set of features, and get an outstanding bargain in the process. If you’re new to a air frying and really just want the benefits with minimum reading and learning, preset programs are the best. Also: More expensive machines don’t even have them (our 3rd best air fryer on this list, which costs more, doesn’t have them,) You pick the setting for the thing you’re going to fry, and walk away. It’s very surprising to get a machine with pre-sets at this price, but GoWISE pulled it off somehow. At 5.8quarts it’s got significantly more capacity than the more expensive #2 model at 3.5quarts. It’s got more capacity than all the models on our list. Bottom line: You can cook your favorite fried foods for a big, hungry family with this thing. With a power output of 1,500 watts, this model will handle a full tray of food without any difficulty. It does not have nearly the output of the 2,100 watts of the #2 Philips AirFryer, but 1,500 watts is sufficient to thoroughly cook food. Most users would probably not notice much of a difference between the overall power performance of these two models. Like the #2 Philips AirFryer model, the GoWISE Electric Air Fryer comes with an adjustable thermostat. This allows you to fine-tune your settings for the best results. Other models, like the #3 T-fal ActiFry, cannot be adjusted, but with the GoWISE, you can adjust the temperature from 176 to 392 degrees. This amount of heat will rapidly pulse through and around your foods to ensure an even distribution of cooking. The timer on the GoWISE model can only be set up to 30 minutes. At its highest temperature setting, this should be enough to cook many of your favorite foods; however, in extreme cases multiple sessions may be needed. It’s rated 4 out of 5 from more than 1000 reviews, it’s got a pretty standard 1 year warranty, and you can choose from a bunch of colors. For your money, you’ll find it hard to do much better. The price just means it’s not the best machine for everyone. The Philips XL Airfryer deserves all the praise it receives. Why’s It Number #2 On Our List? The first thing to notice about the Philips is the power. At 2,100 watts, it is the most powerful air fryer on our list next to the #1 GoWISE and #5 Cozyna, which are each rated at 1,500 watts. With 2,100 watts, this model has more than enough power to ensure that even if you completely fill the basket with food, it will all be cooked thoroughly the first time. Speaking of filling the basket, the Philips Airfryer can accommodate a generous amount of food at one time. Technically speaking, enough to feed 4 people. The basket will hold up to 2.65 pounds of food, which is enough to fry 2 bags of French fries. This is a less capacity than the giant Gowise 8 in 1, but with the extra power, the Philips XL doesn’t need as much space to get the same amount of frying work done. The Philips XL gives you the most control over times (fully adjustable up to 60 minutes, higher than 3 others in our top 5) and temperatures (Up to 390F). They purposely didn’t include pre-sets so that the user can apply the utmost precision to their cooking on each meal. This means you can use this machine to cook the broadest range of foods. You can even use it to replace other cooking appliances if you know what you’re doing. This is a fact that makes the higher price worth paying for many people. The one-touch digital interface makes programming the Philips Airfryer easy. There are no complicated settings to worry about. It comes with a built-in timer that can be programmed up to 60 minutes and automatically shuts off the machine. And even though the inside of the fryer is reaching such high temperatures, with the Philips’ “stay-cool” handle, you can remove the basket from the fryer with your bare hands and not have to worry about burns. The Philips XL Airfryer is the heaviest model on our list. Coming in at 18.98 pounds, the closest to the Philips is the #4 Avalon model, which weighs 14.2 pounds. The greater bulk of the Philips is due to its unique Rapid Air Technology, which enables it to cook food with the greatest speed and best results. With an MSRP of $399 (though you can often find it for much less on sites like Amazon), this is it’s an investment, but one that thousands of customers have been happy they made. With color options in both black and white, the Philips Airfryer is the cream of the crop when it comes to delicious fried foods without the fatty cooking oils. Number 3 on our list is the T-Fal Actifry. This model ended up here because it’s almost the GoWISE: Not quite as cheap but with some features that are very valuable particularly for certain people. Why would you buy this over the #1 GoWISE? a) The basket is ceramic coated for extra durability. b) The warranty on the Actifry (standard 1 year) covers the whole machine, not excluding the basket like the GoWISE does. So you don’t need the extra size of the #1 GoWISE. The T-fal ActiFry has a decent-sized food capacity. With an interior capacity of 2.9 liters, it will comfortably cook up to 2.2 pounds of food at once. This should be enough for families up to 4 (appetites pending!). It’s capacity is on par with the much more expensive Philips XL so you’re still getting good value on this front. Unlike the GoWISE, all the key parts (paddle, pan, lid and tablespoon) are dishwasher safe, so clean up with the Actifry takes much less time. a) The longest timer on our list (which runs up to 99 minutes) which gives significant added control to the user (for example, the ability to cook more slowly and carefully) and increases the range of foods and styles that are cookable in the machine. b) The element of simplicity with no temperature control (one less thing to worry about) and a simple on/off function. c) A lighter weight. At only 10.9 pounds, this air fryer is much lighter than the 18.98 pounds of the #2 Philips AirFryer and will take up less space on your countertop. If you are concerned with storage and lifting the air fryer into position, then this lighter weight will certainly be appealing. It also comes with a cookbook containing 38 different recipes you can use to cook foods with the air fryer, as well as a measuring cup. If you are looking for a simple, less expensive air fryer for your frying needs, then the ActiFry by T-fal is an excellent option. Number 4 on our list is the Digital Air Fryer by Avalon Bay. This model uses a slightly different method than a few other air fryers on our list in that it removes the need for any oil whatsoever. The Avalon Bay technology begins with a fan that extracts the natural oils and fats from the food you are cooking and collects them in a drip basket below the food. It then uses rapid air technology (like other models on our list) to circulate the oils and cook the food thoroughly. The result is crispy food that mimics the effects of traditional deep fryers. The Avalon Bay model is on the lower end power-wise. At only 1,400 watts it has the lowest output of any of the fryers on our list, but even compared to the 1,500 watts of the #1 GoWISE, you will hardly notice the difference. This power is plenty to properly cook most foods if prepared correctly. There has been no testing result which indicates that food has been undercooked by the Avalon Bay Air Fryer. While this model has a smaller output, it does have a generous capacity for cooking large amounts of food. With a basket size of 3.2 liters, it is larger than the 2.9-liter capacity of the #3 T-fal ActiFry. That means you can accommodate larger serving sizes and serve more people if you are planning on using your air fryer for parties. The Avalon Bay air fryer will be able to meet higher capacity demands. Another nice feature of this model is its digital touch-screen controls. Like the #1 GoWISE model, the #4 Avalon Bay comes with preprogrammed settings to make cooking easier, though the GoWISE model comes with one additional program. This takes some of the guesswork out of cooking with an air fryer, which is a nice feature since these machines are likely to be unfamiliar to many users. The Avalon Bay model can heat foods up to 400-degrees and has adjustable temperature control options. This allows for just another level of customization if you like to fine-tune your settings. The Avalon Bay features “no-slip feet” on its bottom to ensure that the air fryer does not slide around during use. It also comes in 3 colors: black, white, and red (depending on availability). With an MSRP of $180 (though, of course, you can often find it for less), this is a “mid-range” priced model. It costs around the same as the #3 T-fal, but is not nearly as expensive as the $399 price tag of the #2 Philips Air Fryer. 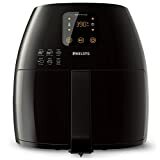 If you are looking to save some money and like the adjustable preprogrammed features of the #2 Philips, then the #4 Avalon Bay Digital Air Fryer is a great option. Number 5 on our list is a simple, straightforward air fryer by Cozyna. This air fryer is easy to use, has all the essential features you would want from a decent air fryer, and comes at an affordable price. Though it is not the least expensive model on our list, the MSRP of $199 means that it is still significantly less expensive than the #2 Philips AirFryer. Plus, most retailers will offer the Cozyna Air Fryer well below its MSRP, so it’s a good idea to check for current prices. At 1,500 watts, the Cozyna Air Fryer delivers more power than several other models on our list. Both the #3 T-fal with 1,450 watts and the #4 Avalon Bay with 1,400 watts do not have quite the strength of the Cozyna. However, as we’ve pointed out before, you are not likely to notice too much of a difference between a few hundred watts. The Cozyna is certainly strong enough to cook all your food thoroughly. The capacity of the Cozyna is also on par with other models on our list. With a basket size of 3.2 liters, it has a larger capacity than the #3 T-fal model, but not quite as much as the #1 GoWISE fryer. With the larger capacity, you will be able to cook more food at once. This should be something to take into consideration if you plan on cooking for large groups. 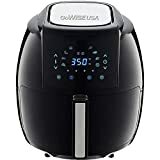 The cooking process of the Cozyna Air Fryer is the same as several other models on our list: it uses a very small amount of oil and rapid air circulation to cook your food at high temperatures and get that deep-fried result. The Cozyna model will cook all your food at 392 degrees Fahrenheit and cannot be adjusted. Other models like the #2 Philips AirFryer and the #1 GoWISE come with temperature control options, but the Cozyna is a simple “on/off” machine. Neither does it come with any digital display, but instead, it uses a simple dial timer to turn on and off. The time can be set up to 30 minutes. This simple “on/off” operation and the inability to control the temperature may mean that certain foods will require a little less or a little more time in the fryer to cook properly. Like other models on our list, this model comes with a recipe book to give you some ideas for how to use your air fryer in creative ways. One area where the Cozyna Air Fryer stands out from all the rest is in its warranty. Whereas all other models on our list come with a standard one-year limited liability warranty, the #5 Cozyna Air Fryer comes with a two-year warranty. No other air fryer comes with this kind of guarantee. The warranty terms will cover any issues arising from manufacturer errors or parts defects that occur within two years of the date of purchase. It will not cover abuse or accidental damage. In addition, some retailers like Amazon offer extended warranty options to increase the longevity of your air fryer. If you are looking for a very simple machine, the Cozyna Air Fryer is a great option. You will not have to worry about any programming features or timer settings. There you have it, our Top 5 Air Fryers of 2018. If you are looking for the best value for a high performance machine, the #1 GoWISE is your pick. It has earned its reputation and high ratings for good reasons. If you want the best of the best, and you’re willing to invest (happy with myself for coming up with that sentence!) get a Philips XL. 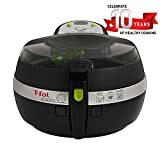 If you’re on a budget, and you hate tidying up, get a T-fal Actifry. If you want maximum health through minimum oil consumption, get an Avalon bay. If you are looking for simple machines without any preprogrammed settings, then both the #3 T-fal ActiFry and the #5 Cozyna Air Fryer are great options. Neither of these models has adjustable temperature settings. They both operate on a simple “on/off” switch. However, the T-fal fryer can be set to up to 99 minutes and has a digital display, while the Cozyna can only be set to 30 minutes and has a dial. Whichever air fryer you decide is right for you, we’re sure these machines will be a great alternative to the deep-fried, fatty foods you’re used to. And with these fryers, you won’t have to sacrifice those great foods entirely, but you will be able to enjoy them in moderation without all the added fat of cooking oils. Excellent info and comparisons that are carried throughout the article to help keep the selection process simple! Thank you! Thank you so much! My family and I have been looking around for a perfect air fryer and thjs website foind it for us. I don’t know what the others say. We are debating which one but I am personally advocating for #2 because of the automatic stirring. Thank you so much for excellent comparisons, a lot of information. Just starting so still haven’t decided but you have certainly cleared up a lot of confusion. Glad to hear it Jan! This article contains affiliate links, but because we’re paid by e-commerce retailers rather than individual manufacturers, we have no financial incentive to promote one product over another. This means we can focus on on putting forth whatever products our research shows are the best value for money for the average consumer Learn more here.